'The Book of the Year, perhaps of the decade, has to be Matthew Sturgis's Oscar' TLS, Books of the Year. A SUNDAY TIMES BOOK OF THE YEAR. 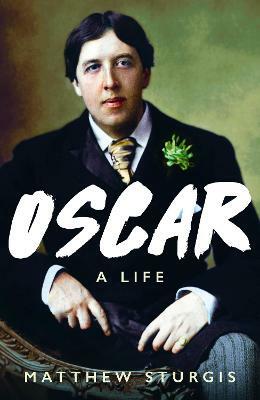 'Simply the best modern biography of Wilde ... A terrific achievement' Evening Standard. 'Page-turning ... Vivid and desperately moving. However much you think you know Wilde, this book will absorb and entertain you' Sunday Times. 'Wonderfully exciting ... Sturgis's great achievement is to take on board his great flurry of contradictions' Craig Brown, Mail on Sunday. '[Sturgis] is a tremendous orchestrator of material, fastidious, unhurried, indefatigable' Observer. 'Oscar Wilde is more fashionable than ever ... Sturgis's account of the hearing at the Old Bailey is as gripping as it is grim' Guardian. 'The Book of the Year, perhaps of the decade, has to be Matthew Sturgis's Oscar which captures the wit, the love-ability, the dramatic genius, the insane self-destructiveness, the originality of Wilde ... [Sturgis] is the greatest chronicler of the 1890s we have ever had' TLS, Books of the Year. Oscar Wilde's life - like his wit - was alive with paradox. He was both an early exponent and a victim of 'celebrity culture': famous for being famous, he was lauded and ridiculed in equal measure. His achievements were frequently downplayed, his successes resented. He had a genius for comedy but strove to write tragedies. He was an unabashed snob who nevertheless delighted in exposing the faults of society. He affected a dandified disdain but was prone to great acts of kindness. Although happily married, he became a passionate lover of men and - at the very peak of his success - brought disaster upon himself. He disparaged authority, yet went to the law to defend his love for Lord Alfred Douglas. Having delighted in fashionable throngs, Wilde died almost alone: barely a dozen people were at his graveside. In the first major biography of Oscar Wilde in thirty years, Matthew Sturgis draws on a wealth of new material and fresh research to place the man firmly in the context of his times. He brings alive the distinctive mood and characters of the fin de siecle in the richest and most compelling portrait of Wilde to date. Matthew Sturgis is a writer with a deep knowledge of the late Victorian cultural world. He is the author of acclaimed biographies of Aubrey Beardsley and Walter Sickert, as well as Passionate Attitudes: The English Decadence of the 1890s. He has contributed book reviews to the TLS, art criticism to Harpers & Queen and football reports to the Independent on Sunday. Matthew is on the editorial board of The Wildean, the journal of the Oscar Wilde society.